Buzz! The Mega Quiz is one of the latest Buzz! 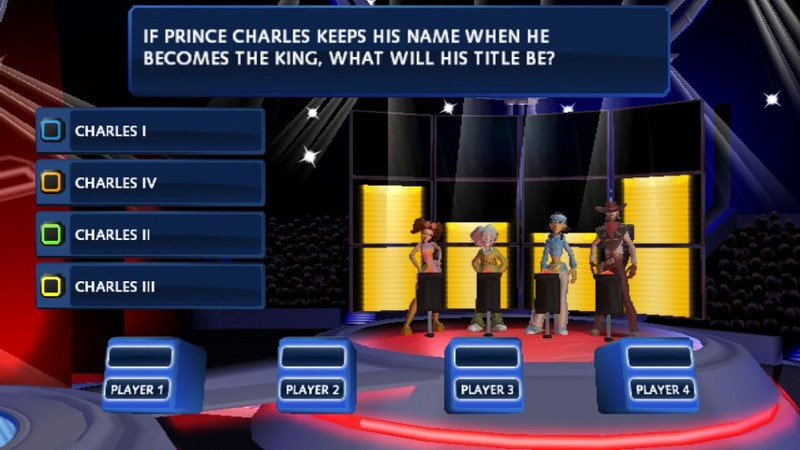 games on the PlayStation 2 that returns one of the world's most popular quiz games with gamers playing against other opponents in order to win huge dollars. With over 5000 questions, there is definitely a genre and question for everyone which easily makes this the most entertaining party games on the PlayStation 2. 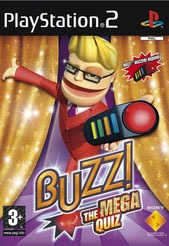 Once again in order to truly experience this title, the player needs to have the "Buzz" buzzers available which can be purchased with this game, separately or previously purchased with other games. The title also contains some mini-games that need the traditional DualShock controller for something completely different. Final Countdown – It can all change in the exciting new final round! The gameplay behind Buzz! The Mega Quiz gives the players a variety of questions to answer and those that answer the fastest by pushing the buzzer and correct colour, wins that question which accumulates towards their points. As with real-world quiz games, the speed of your answer plays a huge factor in beating your opponents. Even if you push first, you still need to answer the question. So make sure, you know what you are talking about. 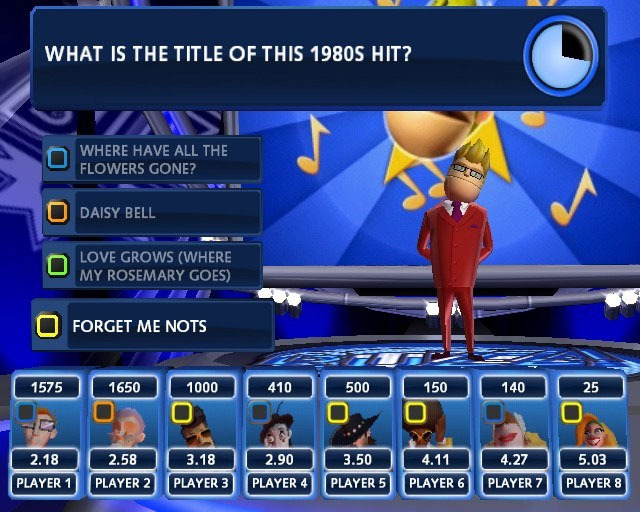 The Mega Quiz contains a plethora of questions with various pictures, music and even video clips to keep the questions varied and entertaining. The first round of a standard quiz sees contestants being allowed to pick categories for each other, which is straightforward enough and pretty easy. Whether it's from sports, history or music, this is as close as some of us will get to competing in a quiz show. By halfway through, you'll be facing elimination from an entire series of questions in Winner Stays On. At the end of the game, all of your scores are converted into precious seconds on a timer which trickle away as you answer questions, with the timer only stopping when you get correct answers, and only granting you extra time when you're the fastest to answer correctly. It's tense, slightly silly, and extremely good fun. Occasionally, you'll find a round which doesn't do much for you such as the Buzz' Mystery rounds in the middle of the standard game are a good example, as they're sometimes entirely random in their allocation of points, often have nothing to do with general knowledge, and don't do much to make the game fun. However, you can skip them entirely by simply creating a custom game and unticking the rounds you dislike or play a really straightforward test of general knowledge by setting how many questions you want, and simply accruing scores for correct answers. The player characters, too, are amusing enough, without having the "straining to be funny" feel that many other games end up suffering from. 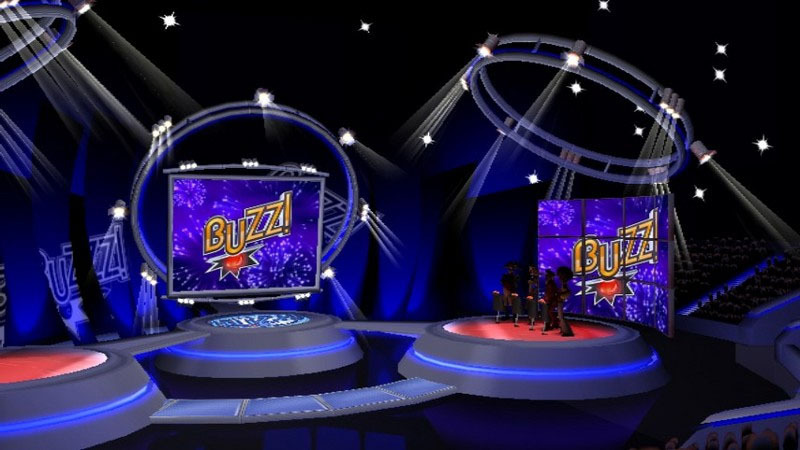 Buzz' co-host, Rose, even gets a few moments in the limelight, particularly when you choose to skip her descriptions of how to play each round. Rather than merely skipping forward, you get a little comment on the way, some of which are funny enough to induce a genuine laugh. It all contributes to a great atmosphere; the little sarky comments, jokes and humorous digs are perfectly tuned to ensure that the experience is fun and irreverent. Graphically, Buzz! The Mega Quizz may not win any accolades with its simplistic graphics but what really draws out the game are the sounds and clips that when matched with gameplay, create something unique. In conclusion, Buzz! The Mega Quiz! is a must have title for those lovers of the Buzz! franchise or for those looking for an exciting party game that everyone can play. Check out!